Porky Pig tries to find a room in a town in which all hotels are full due to a convention. When he finally finds one, he has to share it with a room mate, which turns out to be Daffy at his looniest. Daffy certainly is your worst nightmare of a room mate: he arrives singing loudly, talks to an invisible kangaroo, awakes Porky just out of curiosity, hiccups, steals blankets, puts his cold feet against Porky’s back and spills his glass of water over him. 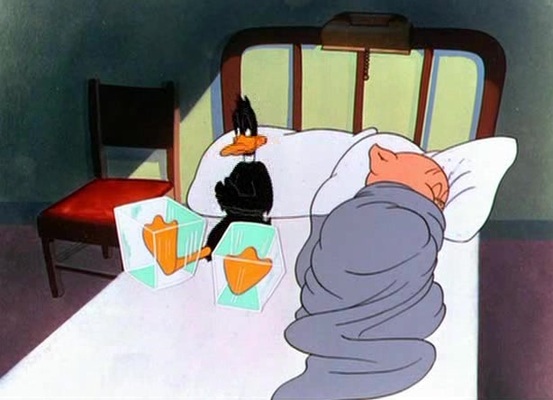 Porky, naturally, throws the looney duck out, but Daffy returns and makes Porky believe it’s morning already, and that he has to catch a train, which Porky eventually does, defying all logic. This zany Warren Foster-penned story undoubtedly is one of Robert McKimson’s finest cartoons. The gags come fast and plenty, and are as insane as they are familiar. ‘Daffy Duck Slept Here’ is one of the last Warner Brothers cartoons to feature the looney Daffy. The result is a cartoon to laugh your head off. On a side note: The elevator gag in this cartoon was reused in ‘Who Framed Roger Rabbit?‘ (1988) starring Droopy as the lift boy. To the previous Daffy Duck cartoon: What Makes Daffy Duck? You’ll never find a better duo than Daffy Duck & Porky Pig and this cartoon is a great example. In fact, I once had a cousin for a room mate exactly like Daffy.